What is Uvarovites' key to abundance? It is it's energy signature that stimulates individuality. Individuality, or the ability to function successfully without "the group (first chakra)" is key toward spiritual development. Life lessons are learned and taught from above while moving up through the chakra energy system. Structurally Uvarovite is calcium chromium silicate. Silica is a mineral found in mineral makeup. Found in Russia, India, Finland and Poland, this stone has a hardness of 7.5. 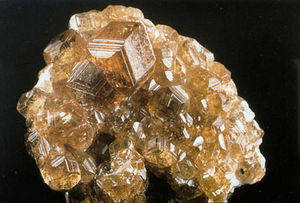 It gets it name from the Russian mineral collector Count S.S. Uvarov. This stone belongs to the garnet family and is emerald green in color. As a result it’s often confused with emerald. The crystal structure of this stone is cubic and it corresponds to the heart chakra. The vibrating number for this stone is 7 and the zodiac sign is Aquarius and the ruling planet is Mars. Uvarovite works well in conjunction with Tsavorite (another member of the Garnet family) and moldavite to manifest abundance in all its forms. 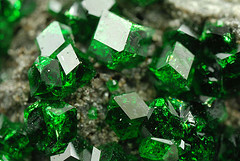 Uvarovite can heal the feeling of scarcity and “not enough” in all its aspects. IT may be about not having enough self confidence or power or love or knowledge or it’s about material wealth; Uvarovite aids in healing the feeling of not having enough. It aids in the opening up of the heart chakra and makes the wearer understand that everything in the universe is available to him when he needs it. Uvarovite helps the wearer to enhance the feeling of contentment and peace. It helps him to understand that the Universe is always there to give him what he needs in all kinds of needs including spiritual evolution. Uvarovite teaches a very important lesson of detachment which means that it helps in releasing all desires and enhancing the flow of universal energy. Uvarovite is a more intense form of Garnet which works with the frequency of abundance and wealth (especially when combined with moldavite). This stone aids in clearing the channels used for receiving and helps the wearer to understand the futility of struggle for abundance. Abundance is the natural state of being which is hampered by struggle. This stone helps in eliminating this struggle and making abundance flow in the life of its wearer. Uvarovite also helps in healing feelings of scarcity on the emotional aspect. Whether it’s a feeling of not getting enough support or love in a relationship or some other emotional issue, Uvarovite helps in healing all these issues. It helps in connecting with the universe with the frequency of abundance, love and joy. It also heals the heart from the past hurts of insufficiency and lack. People often think of solitude with loneliness. Uvarovite helps in understanding that solitude is not necessary loneliness and is sometimes needed for introspection and self work. It aids in manifesting the individualism of a person without enhancing his egoistic nature. It helps the soul to connect to the universe and aids in connecting people spiritually. This stone also enhances the feeling of patriotism through the enhancement of individuality. Physically speaking, Uvarovite aids in healing conditions problems related to the heart and lungs. Also used to treat acidosis, it works to fight diseases like leukemia, infections of the bladder and the kidney, frigidity and disorders. IT also aids in detoxifying the body. Uvarovite can aid in making you stand out in interviews and in your workplace. It aids in attracting people to you and aids in increasing your popularity. Uvarovite even helps you to understand and control the thoughts you manifest. It helps you to enhance your concentration and achieve your goal in the best way possible. There are times when we let go of an opportunity because we don’t recognize it. Some times we don’t act on an opportunity since we are scared or reticent. Uvarovite helps you to let go of fear and recognize and act on opportunities. If you need more opportunities in your business, then put a Uvarovite in the cash register or hang it in your office. It will help you in manifesting your desires and enhancing and recognizing the opportunities. Uvarovite is the perfect stone for fighting with depression. It can renew and enhance your zest for life and help in bringing back the missing passion and vitality. With Uvarovite you don’t need caffeine to enhance your energy; this stone can alone help you. People who are single and looking for a life partner can keep a Uvarovite in their pocket whenever they go out. It will help them to meet and recognize their life partner. IF you want to know that the person is right for you, then keep the Uvarovite under your pillow when you sleep. Your question will be answered in the form of a dream. Uvarovite can also help people in a relationship to stay committed and focused. It can enhance the atmosphere and inspire feelings of love and devotion to each other. It can help partners to see and acknowledge the good qualities in each other. Uvarovite can also assist in traveling safely since it warns the wearer of the imminent danger. Uvarovite is a stone of abundance and individuality which aids in the smooth flow of the universal energy! back to the top of uvarovite page. Interested in self development? Would love to share the monthly Mineral Essence E-zine featuring a crystal perscription that will naturally ease your physical, emotional, mental or spiritual malady and help you feel beautiful. After completing the form below, you will receive an email asking you to confirm the address given just to be sure someone did not submit your email address without your knowledge.